This whole Parachute Mobile concept started so simply, I (Mark Meltzer AF6IM) and Michael Gregg KF6WRW met on the N6NFI repeater in 2008 and learned that we both shared an interest in ham radio and skydiving. We originally envisioned jumping with hand held radios (HTs) and just calling out on repeaters, but when we talked about it among other hams there was a keen interest in expanding our concept and the Parachute Mobile Project was born. Today we have over a dozen dedicated hams on our team and the project has grown to include voice comms, navigation and physiological radio telemetry, HF PSK 31 beaconing, live 2.4 GHz amateur television from aloft, and much more. Our team especially enjoys Parachute Mobile missions that are coordinated with nearby hamfests. Hamfests are conventions or meetings of ham radio enthusiasts and draw a big crowd from a wide geographical area. Pacificon is an ARRL sanctioned event put on by MDARC (Mt Diablo Amateur Radio Club) and draws over a thousand hams to a SF Bay Area location every fall. The 2011 Pacificon event was scheduled for the weekend of October 15 at the Santa Clara Marriott. Although the jumpers would like to jump into the actual hamfest sites, their dense urban locations raise too many safety and FAA issues so we opted for jumping at a nearby dropzone (DZ) and having a manned display at the convention site with operators, video and telemetry data displays and voice comms. We also set up a “parachute control” station on a mountain peak (Mt. Diablo) bridging the DZ with the convention site located on the other side of a mountain range. We performed several practice missions at the Byron CA DZ to be sure that we had all the bugs worked out for the Pacificon jumps. There are so many things that can go wrong with airborne jumper carried video, telemetry and voice comm gear, ranging from power connections, antenna mounts and leads, conflicts with the parachute gear, etc. Amazingly we got it all worked out. Our Data Dude, Mikey NE6RD, even got a home brew wireless weather station set up on the DZ to give us second by second wind and other weather data using an enhanced Bluetooth radio link to the command center at the DZ. When Saturday morning October 15th rolled around, various team members deployed to Pacifcon, Mt Diablo and the DZ at Byron. The weather was perfect, clear skies and light winds. Michael Gregg KF6WRW and RCAF Capt. 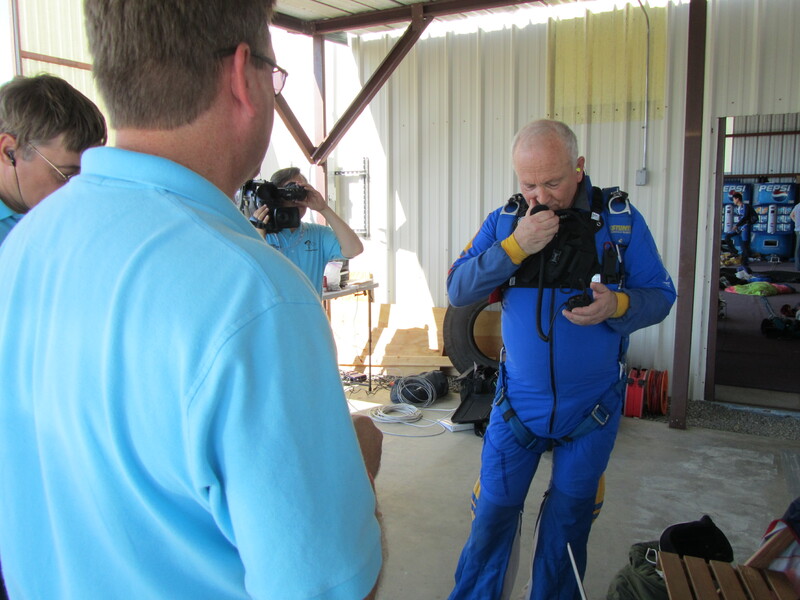 Jim Wilson, our camera flyer made the first jump from 13,500 ft. We were all literally holding our breath to see if the live video from Michael’s 2.4 GHz setup would work. There were a lot of whoops and high fives at the DZ command center when clear video was received and Michael called the DZ saying that his safety checks were complete and that he was ready for Pacifcon QSOs. Michael Wright, K6MFW, who is a very experienced skydiver and ATV enthusiast, had all sorts of video gear set up and was displaying and recording the video from the ground and from the jumper. Team Coordinator Rob Fenn KC6TYD at the DZ command center handed off KF6WRW to Darryl Presley KI6LDM at parachute control on Mt Diablo who cleared the jumper for QSOs and the fun began. At 13,000 feet the radio coverage area is huge and what might sound like a clear channel to one ham on the ground sounds like a big pileup to the jumper as hams from a hundred mile radius compete for a QSO. KF6WRW sorted it out and made a number of Pacificon QSOs and also with hams in other communities as far away as Sacramento. The Pacifcon attendees were thrilled to see live video from Michael’s camera sent to the DZ on 2.4 GHz and relayed to the convention site over Justin TV, an Internet streaming link. Jim Wilson was flying a unique pink colored high aspect ratio canopy known as Pink Floyd. Pink Floyd has an incredible glide ratio and speed range which allowed Jim to literally fly circles around Michael to get good still camera photos. At one point Jim dragged his feet across the top of Michael’s canopy to get a close shot as he came off the other side. On the next jump Michael Gregg and I jumped together. As my chute opened I started making my safety checks, especially looking for damage to the canopy or the suspension lines that might necessitate a cutaway. Everything was shipshape but I delayed my “safety checks complete” call to allow a brief frequency excursion to the N6NFI repeater to accommodate a request from a ham in the UK to make a Parachute mobile contact. I had to take my HT out of its harness pocket and select a different frequency from the Pacifcon channel. I prayed that I wouldn’t drop the HT while changing channels. Pink Foster KG6ILA, Jon Gefaell K6OJ (a Parachute Mobile co-founder) and Andy Korsak KR6DD all helped out to make the UK QSO happen. Echolink, an Internet voice service for hams, would allow the UK ham to use N6NFI for a contact with me. The voice packets would route through K6OJ’s Echolink node in Hayward CA which was being controlled by Pink in Tucson AZ. It was a dazzling mish mash of radio and Internet technology and it all worked, well almost. Pink answered immediately when I made my initial call on N6NFI from about 13,000 feet and had been recently in contact with Ian, the UK ham. Unfortunately Ian had dropped off Echolink when I came up on N6NFI, but I did get to talk with Pink and a number of other hams in my very brief time on that frequency. Next I called the DZ and announced “safety checks complete”. The handoff was made to parachute control on Mt Diablo manned by Darryl KI6LDM and his wife Rodna KJ6GVQ. Parachute control gave me the go ahead for QSOs and I made my first call. I was mobbed with replies and tried to sort them all out. It was a madhouse but I made it easier by only repeating back call suffixes and saying a brief but unorthodox “next” to invite further calls after making a contact instead of the time honored standard “Q R Zedd’ call which eats up a tiny bit more time. Rodna KJ6GVQ rarely talks on ham radio but at my request she made an exception and had a QSO with me as I descended. I had an onboard digital audio recorder which could help me complete logs and QSL cards later. The purists wouldn’t like my breach of protocol, but I did what I had to do to get the maximum number of QSOs. It wasn’t a contest with rules, just a fun ham radio parachute jump. KF6WRW had me in sight and called me, “Jumper 1 from jumper 2, Hey Mark, turn right”. I did and saw him flying nearby shooting video. We chatted a bit but kept a safe separation while we worked our way back to the DZ flying over gorgeous fall scenery. We could see SF Bay, the Delta and a huge panoramic slice of Northern CA. We could see quite a few airplanes too, above and below us, fortunately none too close. Passing through 3000 feet I terminated ham QSOs and asked for a wind update from the DZ. Team member Bernhard Hailer responded on our 440 MHz band tactical frequency. I didn’t hear him and made the request again. My astute team members figured out instantly that my 440 MHz receiver wasn’t working and repeated the wind info on our Pacificon working frequency without missing a beat. I love working with the “heads up” hams on my team, especially when communications are so critical to the safety of our mission. The winds were low and steady and I adjusted my approach trajectory accordingly. Michael and I both made smooth standup landings right in the middle of the landing area. With help from our DZ ground crew, we shut off power to various pieces of radio gear, gathered up our collapsed chutes and headed back to the command center to shed the rest of our gear, debrief, repack and prepare for another jump. Yeah, we are crazy, the whole Parachute Mobile team. Combining skydiving with ham radio is a crazy idea, but we love doing it. We had a great time doing the Pacificon 2011 mission and we look forward to another hamfest jump mission in conjunction with Radiofest 2012 in Monterey CA. In the meantime we will perfect new gear, plan new jump profiles and continue preparing for eventual high altitude ham radio jumps with oxygen gear. Until then, look up. We are Parachute Mobile: on the air, in the air, taking ham radio to new heights.